If you’ve been following me for a while, you’ve probably noticed I’m a big fan of cake. Tall, epic, gorgeous, naked layer cakes to be exact. I’ve shared several over the last year or so (see here, here, and here!) but this Vegan Funfetti Cake is hands down my absolute favorite. Why is this cake so special you may ask? #3- it is SO FREAKING delicious and each bite is like a tiny happy childhood memory that melts on your tongue. These types of cakes require a few items of special equipment- namely acetate sheets and a 6″ spring form pan. In other exciting news, Carrots and Flowers is featured in this month’s issue of Thrive Magazine! It’s the leading vegan magazine in the US and we are truly honored to be a part of it! If awesome vegan kitchen hacks and delicious recipes are your thang, we highly suggest picking up a copy. Most grocery stores should have them, including Kroger, Target, Safeway, Whole Foods, and so many more!! Don’t forget to rate this Vegan Funfetti Cake recipe in the comments and tag a photo #carrotsandflowers on Instagram if you make it! The ULTIMATE Vegan Party Cake! Fluffy funfetti cake with vegan cream cheese frosting, filled with plenty of sprinkles and strawberries for fun and flavor! Make the Birthday Cake Crumb- Preheat the oven to 300 degrees F. Line a rimmed sheet pan with parchment paper or Silpat. Combine the sugars, flour, baking powder, salt and sprinkles in the bowl of a mixer fitted with a paddle attachment. Mix on low speed until well combined. Add the oil and vanilla and mix on low speed until small clusters form. Spread the clusters on the prepared sheet pan. Bake for 20 minutes, breaking up the clusters once or twice during baking. The crumbs should be slightly moist to the touch; they will dry and harden as they cool. Allow the crumbs to cool completely on the pan before using. The birthday cake crumbs can be stored in an airtight container at room temperature for 1 week, or in the refrigerator or freezer for up to 1 month. Make the Birthday Cake- Preheat oven to 350 degrees F. Spray a quarter sheet pan with non-stick cooking spray and line with parchment paper, or with Silpat. In a small bowl, combine the non-dairy milk with the vinegar. Let rest for 5 minutes to make vegan "buttermilk." Then, in a measuring cup, combine the vegan buttermilk, grapeseed oil, and vanilla extract. In a medium bowl, whisk together the flour, baking powder, salt, and ¼ cup of the sprinkles. Combine the vegan butter, shortening, and sugars in the bowl of a stand mixer fitted with the paddle attachment and cream together on medium-high for 2 to 3 minutes. Scrape down the sides of the bowl, add the flax "eggs", and mix on medium-high for 2 to 3 minutes. Scrape down the sides of the bowl once more. On low speed, gradually pour in the buttermilk mixture. Increase the mixer speed to medium-high and beat for 4 to 6 minutes, until the mixture has nearly doubled in size and is completely homogenous (don’t rush this step!). Stop the mixer and scrape down the sides of the bowl. On low speed, gradually add the flour mixture and mix just until the batter comes together, about 45 to 60 seconds. Scrape down the sides of the bowl and give the batter a final mix with a rubber spatula. Spread the cake batter in an even layer in the prepared pan. Sprinkle the remaining 2 tablespoons rainbow sprinkles evenly on top of the batter. Bake the cake for 30 to 35 minutes; when you gently poke the edge of the cake with your finger, the cake should bounce back slightly, and the center should no longer be jiggly. Place the pan on a wire rack to cool completely. The cooled cake can be stored in the refrigerator, wrapped in plastic wrap, for up to 5 days. Make the Birthday Cake Frosting- In a small bowl, whisk together the glucose, corn syrup and vanilla extract. Combine the vegan butter, shortening and vegan cream cheese in the bowl of a stand mixer fitted with the paddle attachment and cream together on medium-high for 2 to 3 minutes, until the mixture is smooth and fluffy. Scrape down the sides of the bowl. With the mixer on its lowest speed, stream in the glucose mixture. Increase the mixer to medium-high speed and beat for 2 to 3 minutes, until the mixture is silky smooth and glossy. Scrape down the sides of the bowl. Assemble the Birthday Layer Cake- Put a piece of parchment or Silpat on the counter. Invert the cake onto it and peel off the parchment or Silpat from the bottom of the cake. Use the cake ring to stamp out 2 circles from the cake. These are your top 2 cake layers. The remaining cake “scrap” will come together to make the bottom layer of the cake. Layer 1, The Bottom: Clean the cake ring and place it in the center of a sheet pan lined with clean parchment or a Silpat. Use 1 strip of acetate to line the inside of the cake ring. In a small bowl, whisk together the non-dairy milk and vanilla extract for the birthday cake soak. Using a pastry brush, brush half of the soak over the top of the cake. Using the back of a spoon, spread one-fifth of the frosting in an even layer over the cake. Sprinkle one-third of the birthday cake crumbs evenly over the top of the frosting. use the back of your hand to press them gently into the frosting. Use the back of a spoon to spread a second fifth of the frosting as evenly as possible over the crumbs. Layer 2, The Middle: With your index finger, gently tuck the second strip of acetate between the cake ring and the top ¼ inch of the first strip of acetate, so that you have a clear ring of acetate 5 to 6 inches tall. Set one of the cake rounds (the more imperfect of the two) on top of the frosting, brush with the remaining soak, and repeat the process for Layer 1 (a fifth of frosting, a third of crumbs, and another fifth of frosting). Layer 3, The Top: Nestle the remaining cake round into the frosting. Cover the top of the cake with the last fifth of the frosting. Garnish the frosting with the remaining birthday crumbs. *To make flax "eggs" combine 1 Tbsp ground flax seed with 2½ Tbsp water for one egg. Stir well and let sit on the counter for 10 minutes to thicken. *The glucose and corn syrup make the frosting thicker. It can be omitted for a slightly softer frosting. *Nutritional information not included cause it's better not to know in this case! 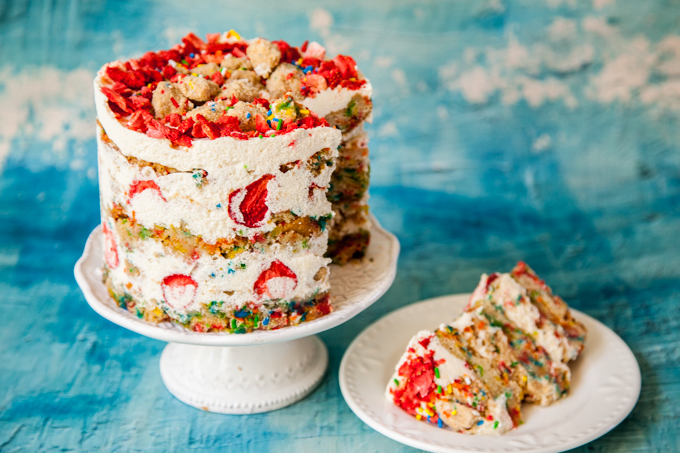 Is there a way to make the Vegan Funfetti Cake gluten free? Do you have suggestions for GF flour replacement for “cake flour”? Where did you find the vegan sprinkles?! I’ve seen a few on Etsy. Ever since I went vegan I’ve been wanting to try a nice and delicious cake recipe. Thank you for posting yours, I’m gonna try it this weekend. Wow this looks like the perfect cake! Yum! My family and I tried it yesterday and LOVED it. It is extremely rich so we all had to eat small pieces. Have you tried this using Stevia as a substitute for the white sugar? Just wondering if it would be just as good/bake as well with that instead. Thanks for the great recipe! It doesn’t say what to do with the freeze dried strawberries.